It is tough to find well made, affordably priced yoga wear so today let us shop around for you as we review the best online stores to find discount yoga clothes! When looking for yoga apparel women are generally seeking a few things. Comfort—the clothes HAVE to more with my body, no chafing or rubbing. Fit—the clothes need to have a great cut and keep everything in place. Quality—I want to know if the fabric is well made and appears like it will hold up well. Style-because of course you have to look cute and often these clothes will take me out to run errands as well. Price point—needs to be reasonably priced so she can look good and still stay on budget. Shopping for yoga clothes online is certainly challenging but you can find some great, cheap yoga apparel online. Because it is difficult to assess comfort, fit, and quality online it is important to pay close attention to reviews, the fabric and fit guide, as well as the stores return policy. Here are some of the advantages and disadvantages of shopping at some prominent online yoga clothing retailers. Click here or on the picture above to go to Manduka’s website! Pricepoint: Tops $38 and up. No bottoms available. Commitment to eco-friendly yoga clothing and products. Eco-friendly tops like this tank demonstrate commitment to earth conscious habits. Lots of other yoga supplies like cushions, yoga towels, mats, bags, and water bottles. Manduka has a great variety of yoga bags, like the one above, to use during your practice. Tanks and t-shirts look stylish, soft, and comfy. 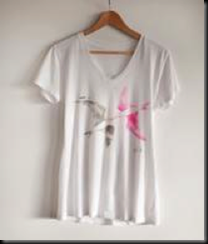 Comfy tees like this one abound on Manduka.com! Fabric is said to be lightweight and breathable. Not a lot of selection in the yoga clothing line. $10 restocking fee for returns. Click here or on the picture above to check out activewearusa’s great range of discount yoga gear! Pricepoint: Tops $29 and up. Pants $50 and up. Lots of options comfortable and stylish yoga apparel options—30 plus brands available in their yoga line including Jala, Prana, and Anjali. 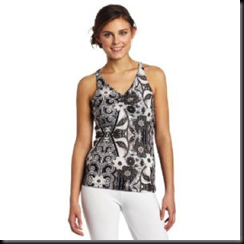 This Prana Quinn Chakra Top is an example of just one of the many yoga tops available at Activewearusa. Check it out by clicking here or on the picture above! It has a wide range of other active wear (running, hiking, dance, cycling) making it a one stop shop for online fitness clothing. You can also get running gear like these tights at ActivewearUSA! There are a lot of products available with moisture wicking fabric is available, which is great for hot yoga! 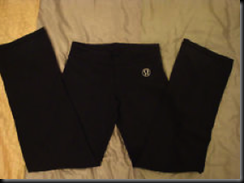 These capris are perfect for hot yoga! Positive reviews on many items of clothing. 60 day return policy for unused items. 100% Price Guarantee—they will match online price of same item from any other online retailer! While the wide range is a great aspect of activewearusa, there are so many options that picking yoga wear could become overwhelming for some. Be sure to check the sizing information as fit varies from item to item. Rating: 5 out of 5 – TOP PICK! Click here or on the picture above to check out the Barefoot Yoga store. Price point: Tops $40 and up. Pants $51 and up. Eco friendly fabrics such as organic cotton and hemp products. Selection focuses on two well known and respected brands: Prana and OmGirl lines. These bright tanks from Omgirl will liven up your yoga wardrobe! 30 Day return policy in resalable condition. Cool colors and printed bottoms. Shop includes yoga accessories: mats, blocks, rugs and other props. 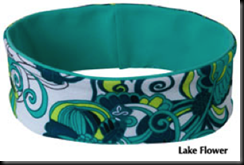 Jazz up your yoga and keep flyaways at bay while practicing yoga with these cute headbands! Not as wide of a selection of yoga clothes as some of the other retailers. No fit guides to assess clothing or a lot of clothing reviews. Rating 3 out of 5. Click here or on the picture above to check out Asana Green’s yoga store. Price point: Tops $40 and up. Pants $50 and up. 12 brands of clothing including Green Apple Active, Anjali, and Verve. These Microflare yoga pants are comfy, cheap, and stylish! Earth friendly materials used in clothing—always a plus! Check out this hip tank made of 50% organic cotton and 50% recycled poly! The sight overall had a very hip and calming feel about it. Clearly someone who lives and breathes yoga – and and inside of the yoga studio – runs this site. Asana Green is a relaxing shopping experience. Full Money back guarantee within 60 days and no hassle return policy (as long as tags are on and clothing has not been washed or worn. Most tops were cotton and lycra or poly blends; so they are stretchy but not moisture wicking for more intense yoga sessions. Not quite the full variety of some of the larger stores. Click here or on the picture above to go to the Y Catalogue store. Pricepoint: Tops $22 and up. Pants $50 and up. Lowest entry price for tops from the traditional online shops. 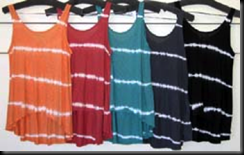 Especially cute colors and designs in their tanks, camis and bras. 30 well-known yoga brands available. They have some great deals such as buy 2 products and get 30% off and free shipping on all orders. 1.5% of their total sales are donated to charity. You can feel extra good about shopping here! Helpful sizing chart on some clothing items. There don’t appear to be any reviews on their website it can be hard to know if anything is unusual about the fit and quality either positive or negative. 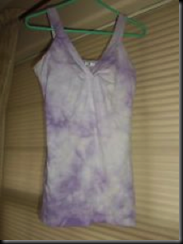 Click here or on the picture above to see eBay’s selection of yoga clothing. You can get deeply discounted name brand clothing. You can buy yoga clothing in lots, getting more for your money! Tanks, and Camis, and Pants—Oh my! Click here or on the picture above to check them out! Some new pieces of yoga wear are also available. You can look for hard to find Lululemon or other discontinued pieces. Lululemon for $30? Yes please! Click here or on the picture to purchase! Many clothing items are gently used. Pieces may be pre-owned when you buy from E-Bay, but if you don’t mind this, then you can find some great bargains! Click here to check it out! There are no guarantees on how worn pieces may be or what condition you could buy them in. There are also no return policies. If the item is of inferior quality or doesn’t fit properly you are stuck with it. Click here or on the picture above to check on Amazon’s selection of discount Yoga Clothing! You can find sometimes find cheaper prices for tops and bottoms. 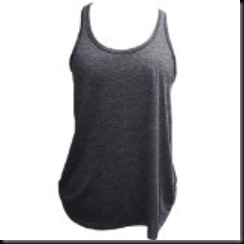 A Prana tank was recently selling for $26 on Amazon; the same tank at some of the other traditional online retailers was priced between $50-$60. Great yoga tanks can be found for a steal on Amazon.com! Amazon reviews are always a helpful and informative about size, fit, comfort, quality, and durability of pieces. This tank is getting great reviews on Amazon! You may or may not find your favorite piece again for the same price. Some pieces were priced similarly to the more traditional online yoga clothing retailers. There certainly are a lot of options for the yogi girl that wants to score a great deal on her yoga gear without sacrificing style, durability, comfort, or name brand options. Take a little time to shop around and you will definitely find quality discount yoga clothes from online stores. Next post: Zumba Clothing for Sale – We Review the Best Places to Buy! Best Shoes for Zumba – We Review the Top 5! The Best Crossfit Shorts: We Review the Top 5! Best CrossFit Shirts – We Review the Top 5! Zumba Clothing for Sale – We Review the Best Places to Buy! Cheap MMA Gear – We Review the Best Stores!